It is said heart and soul of a good knife is its blade. In the case of most folding sailing knives the heart maybe the blade but the soul is its marlin spike. While other blades are found on sailing knives most sailors will agree the sheepfoot blade and the marlin spike are the prinicple parts of the sailing knife. This page gives a brief description of the blades/implements commonly found on sailing knives. Many people will refer to any tool or implement found on a folding knife as a type of blade. Others consider only implements with a sharpened edged designed for cutting should be considered a blade. To see a description of the blade/implement type simply click on the appropriate choice. Click again to hide the defintion. The sheepfoot has a spine and edge running parallel until the very end of the blade. At the very end, the spine drops in almost 90° arc to meet the cutting edge. Only the cutting edge is sharpened. The blade is named for its resemblance to a sheep’s foot. The blade is often called a sheep foot, sheep’s foot or sheepsfoot, depending on manufacturer. There are numerous stories about why the sheepfoot blade appears on sailing knives instead of a clip or spear. Some claim that ship's captains would either break of file off the points of knives in order to make them less of a threat during mutinies or fights. The more plausable reason is the sheepfoot blade allows for the most cutting surface for blade length while allowing for a thick spine for almost the entire length of the blade. Despite the rope cutting advantage of the sheepfoot blade, many sailors want a blade with a point. Thus, many older rigging knives especially those used by military forces will have been re-shaped into a spear or clip blade. A tell-tale sign is that the point of the altered blade is the point of the blade is often exposed when it is folded into the handle. This decreases the value of the knife for most collectors. However there were many nautical knives made spear blades and these were very popular. Many were issued to military forces during the World Wars . However aroudn the time of World War II, became the more favored style of blade form most nautical knives. The sheepfoot is often called a coping blade or sometimes a coping-sheepfoot, depending on manufacturer and the overall general appearance. The marlin spike is pick like blade used for undoing knots and splicing lines. While on some folding knives it may resemble an awl or punch, it has one distinct difference; it never has a sharpened edge. A marline is a small cord of two loosely twisted strands, used as for winding around ropes or cables to prevent fraying, the marlin spike (originally a marline spike) was used to loosen marlines. Besides use with line work, the marlin spike is also commonly used to pull clevis pins out of shackles. See also: "How the Marlin Spike Got Its Name"
Can openers tended to be a popular third blade on some rigging knives. At one time, when rations were stored in cans this probably proved more useful. Today's can opener is purpose built for opening cans and can be used for little else. The long curving point however can be used for scribing lines and with a little help from a round file the inner curve can be sharpened well enough to strip wire or cut small lines; thus making the can opener a little more versatile. .
Often called a bottle opener, the cap lifter is less common on sailing knives today than in the past. Part of the reason is the introduction of screw-off caps but another reason is that modern can opener blades and shackle keys can be used as "make-do" alternatives. With that said, for a time many older rigging knives that employed a split-blades or old style can openers incorporated a caplifter into the base of the blade; allowing the blade ot serve two purposes. Today's stand alone caplifters are modeled after the Swiss Army combination screwdriver-caplifter blades. Similar to the Sheepfoot except instead of ending in a rounded point, the blade ends in a right angle 90° angle or an angle up to around 120° from spine to cutting edge. The front angled cut is not sharpened. Only the cutting edge is sharpened. Some rope knives have a large coping blade or a coping-sheepfoot blade. This was common on rope knives issued to the U.S. Coast Guard and Merhcant Marines around the time of World War II. Many knife makers use the term sheepfoot and coping interchangably. Don't get too hung up on the nomenclature. The hawkbill or hook bill is similar to the sheepfoot but instead of being straight, the edge is concave and thus forms a shape similar to a hawk’s bill. The hawkbill’s shape makes it easier for the blade to cut through lines when the line is cut by hand. However, the blade design is at a disadvantage when the blade has to be pounded on to cut through a line. Hawkbills are a popular choice for cutting lines but are often considered a garden knife or pruner. When used on the water, they are normally called often called Hawks, hookbills, or hook blades. On some older rope knives a secondary blade might be a pen blade making the knife similar to a Barlow with a sheepfoot blade. This is especially true of the No. 40 Knife. Saw blades are very rare on true rigging knives; in fact, I’ve only seen one rigging knife with a saw blade. 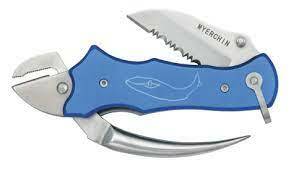 With that said they do appear on Victorinox pocket knives designed for sailing as well as a few sailing multi-tools. A flat head screwdriver is often built into the frame of rigging knives. British MOD 2 and 3 piece clasp knives have been doing this for over a hundred years and the practice has been copied in the civilian market. It is normally part of the center liner that separates the sheepfoot blade from a secondary implement. In some instances a separate screwdriver-cap lifter blade may be present but this is very rare with the exception of Swiss Army sailing knives and multi-tools. The shackle key is as unique to the world of sailing knives as the marlin spike. It is a flat unsharpened blade with an elongated tear drop shaped hole that narrows at the handle end of the blade. It is used for loosening shackles (butterfly like screw heads) on ships and boats. (To be more precise, the shackle key loosens the screw pin that holds the shackle in place, thus shackle key; it opens a shackle.) On folding knives, the shackle key is often a blade unto itself, or a hole cut in the main blade, or is built into the frame of the knife. The shackle key also cut into marlin spikes; giving the spike a resemblance to a large needle. Similar to the sheepfoot, the sheepshead is a thicker blade with a noticeable hump along the spine to allow for a thumb hole, shackle key, or similar devices used for easy one hand opening of the blade. This is found on some newer model sailing knives. Also called a sheep’s head or sheep head. The blade shape is a signature feature of the Myerchin designed "P300 Working Tool"
Considered by many to be the most versatile and most common blade type, the spear is a long single edged blade with a tip that ends in a centered sharp point. There are some sailing knives that are manufactured with spear blades but there are also many older military issued riggers that had their sheepfoot blade modified into a spear blade by their owner. The split blade. The blade is used to open cans. The ones on sailing knives are normally quite large companred to the same style of can opner on other pocket knives. There are many myths about the split blade but the fact is simple; it is just an odd shaped can opener. You can use to strip wire and cut cloth but you will find that it does a rather poor job. Compare images below to see difference between the old style can opener and the split blade. The Wharncliffe blade has a spine that drops in a gentle curve from tang to tip, to a straight cutting edge and forms a sharp point. The dropping spine is not sharpened. It is not normally seen on sailing knives. However it is popular choice on nautical rescue knives. You will see the word misspelled warncliff, and warncliffe. Some manufactures call their wharncliffe blade a sheepsfoot or hawkbill blade. A recent addition to the rigging knife is an integral wrench that uses the handle and the marlin spike as the handle of the wrench and the wrench head built into the end cap of the knife. These types of rigging knives are normally called a sailor’s tool. The wrench is primarily used to loosen shackles and provide a solid grip on small lines or cables.